The death of a man held in Thailand over lèse-majesté laws highlights the gap between rulers and their people. Southeast Asian governments are prone to gloating over their economic success and are rarely shy when it comes to cultural assertions. But for all the ranting and raving about Southeast Asia as a success story, public attitudes just don’t seem to be toeing the official line. In fact resentment in many quarters appears to be on the rise despite attempts by people in high places to assert their superiority. Islamic clerics have proved Malaysia still has one boot firmly planted in the Middle Ages after they issued a Fatwa against pro-democracy demonstrators and the Bersih movement, which Prime Minister Najib Razak claims is out to topple him. They really just want clean elections. In Cambodia, the murder of environmentalist Chhut Vuthy continues to rankle after a government inquiry seemed to raise more questions than it answered, although the government has moved to quell discontent by announcing the suspension of land allocations in a bid to curb illegal logging. In Thailand, the death of a 61-year-old grandfather has again highlighted the yawning gap between the ordinary person who walks in the street and the ruling classes, regardless of political persuasion or the color of their shirt. Ampon Tangnoppakul, a polite, working class man who lived with his mother had suffered from several health issues including mouth cancer that impaired his speech. He was jailed for 20 years for a crime he apparently knew nothing about. 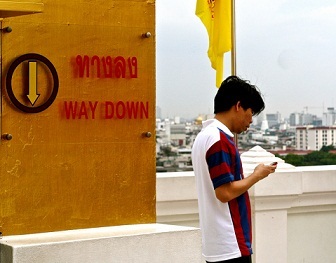 Four SMS messages had been sent to the personal secretary of the then-Prime Minister Abhisit Vejjajiva, deemed offensive to either the king or queen. Lèse-majesté laws strictly forbid any action that could defame or insult the king, queen or crown prince. He added that he went to visit the King in the hospital where he signed a book of well-wishers. “I did not do it,” he told the court. In his defense, Tangnoppakul argued he didn’t know how to make or send an SMS, is barely competent with a mobile phone, did not know Somkiat Krongwattanasuk, the person who received the messages, nor his phone number. Such claims apparently couldn’t be proven and were deemed irrelevant. In Thailand it’s illegal to criticize the courts. Uncle SMS remained a much loved figure up till his death. Media reports say the former truck driver, who liked to babysit his grandchildren, looked much older, worn out and tired. He often cried in prison. Not unlike Chhut Vuthy or Ambiga Sreenevasan – the most prominent of Bersih leaders calling for fair elections in Malaysia – Uncle SMS became the public face for a cause. All sides of Thai politics have ignored calls for the reform of lèse-majesté laws, despite a speech from King Bhumibol Adulyadej in which he said he wasn’t opposed to criticism of the monarchy at all. No member of the royal family has ever filed a charge of lèse-majesté. Instead of reform, both sides of Thailand’s enormous political divide have been accused of using the laws to silence their critics, and it remains probable that Uncle SMS was collateral damage – cold comfort for his family and friends but perhaps a rallying cry for those fed up with this country’s warring politicians and the legal tactics they deploy.